Common dolphins are energetic acrobats and one of the fastest of all cetaceans. They can reach a maximum speed of 65km/h. They are medium-sized; adults range between 1.9 and 2.5 m (6.2 and 8.2 ft) long, and can weigh between 80 and 235 kg (176 and 518 lb), although the range between 80 and 150 kg (180 and 330 lb) is more common. Males are generally longer and heavier. The color pattern on the body is unusual. The back is dark and the belly is white, while on each side is an hourglass pattern colored light grey, yellow, or gold in front and dirty grey in back. They have long, thin rostra with up to 50–60 small, sharp, interlocking teeth on each side of each jaw. 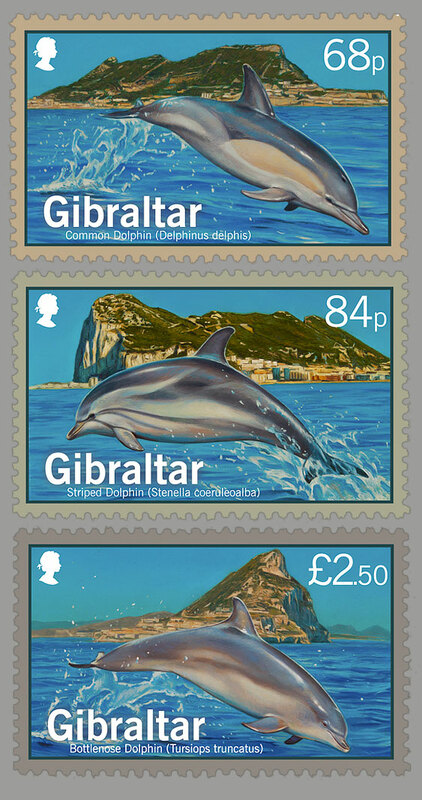 Striped dolphins are often seen in mixed-species groups with common dolphins in the Strait of Gibraltar. Full-grown individuals have a size of around 2m and weigh about 100kg. The striped dolphin has a similar size and shape to several other dolphins that inhabit the waters. However, its colouring is very different and makes it relatively easy to notice at sea. The underside is blue, white, or pink. One or two black bands circle the eyes, and then run across the back, to the flipper. These bands widen to the width of the flipper which are the same size. Two further black stripes run from behind the ear - one is short and ends just above the flipper. The other is longer and thickens along the flanks until it curves down under the belly just prior to the tail stock. Above these stripes, the dolphin’s flanks are coloured light blue or grey. All appendages are black, as well. At birth, individuals weigh about 10 kg (22 lb) and are up to a meter (3 feet) long. By adulthood, they have grown to 2.4 m (8 ft) (females) or 2.6 m (8.5 ft) (males) and weigh 150 kg (330 lb) (female) or 160 kg (352 lb) (male). Research suggested sexual maturity was reached at 12 years in Mediterranean females. Longevity is about 55–60 years. Gestation lasts about 12 months, with a three- or four-year gap between calving. These dolphins are grey, varying from dark grey at the top near the dorsal fin to very light grey and almost white at the underside. This countershading makes them hard to see, both from above and below, when swimming. Adults range in length between 2 and 4m (6.6 and 13.1ft), and in weight between 150 and 650kg (330 and 1,430 lb). Males are, on average, slightly longer and considerably heavier than females. In most parts of the world, the adult’s length is about 2.5 m (8.2 ft), with weight ranges between 200 and 300 kilograms (440 and 660 lb). Their size varies considerably with habitat. Except in the eastern Pacific, dolphins in warmer, shallower waters tend to be smaller than those in cooler, pelagic waters. A survey in the Moray Firth in Scotland, the world’s second northernmost dolphin population, recorded an average adult length of just under 4m (13ft) compared with a 2.5m (8.2ft) average in a population off the coast of Florida. Bottlenose dolphins can live for more than 40 years.